There are many wisdom stories but very few wisdom films. Readily coming to mind are Peter Brook's Meetings with Remarkable Men and Ingmar Bergman's The Seventh Seal. Others, such as Being There, the screen adaptation of Jerzy Kosinski's novel; Ground Hog Day; and, more recently, The Apostle and Dark City; have promising premises but either circle their subject, drop it immediately, or become consumed with character. 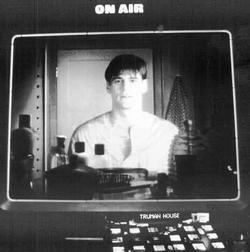 Now comes The Truman Show, a true, full-bodied wisdom film, a modern Ulysses minus any Joycean cerebral negativity and spiritual myopia. Director Peter Weir, best known for Picnic at Hanging Rock and the Dead Poet's Society, depicts the completely hermeticized, conditioned and scripted life of Truman Burbank (Jim Carrey) who lives in a perfect place in a perfect world with everyone's attention focused completely on him. Every egotist's dream come true, it is an all-consuming dream whose only problem isit's all phony. Truman's birth was indeed real, but the world he was born into was make-believe. His world, for all its pretence to real life, is actually a worldwide television show broadcast twenty-four hours a day that Christof (Ed Harris), the creator and director of the television show, has staged for the entertainment of the vast planetary audience. As Cristof's 5,000 hidden cameras record Truman's every waking and sleeping moment, TV viewers, tired of watching actors pretending to feel, love to watch Truman as he lives his lifegrowing up, working, dating, marrying and still grieving the childhood loss of his father by drowning. Everyone in this ongoing 30-year drama is acting, playing a roleexcept Truman, who totally believes in everything he says and does, whose every manifestation and feeling he thinks is "real." For Truman, Christof has created "a world in a bubble" located on an island which simulates a real, functioning town called Seahaven. In this virtual reality, everything is controlled and directed by Christof, even the weather. Except for Truman, who at birth was adopted by Christof's corporation, everyone is a hired actor. In order to make Truman believe in Seahaven, all of the thousands of actors continually affirm the big lie of the town's reality. As a schoolboy, for example, Truman declares that when he grows up he wants "to discover new places in the world." This inner urge is squelched by a teacher who tells him, "Oh, but Truman, you're too late! Everything has already been discovered!" The only world Truman knows is the safe, mechanical and endlessly repeating world of Seahaven, where every morning neighbors give Truman the same greeting, evoking the same response from him"Good Morning! and oh if I don't see you later today Good Afternoon! Good Evening! And Goodnight!" Truman is thus the fool of the tarot who, uncritically believing in the reality of his impressions, becomes encased in false mannerisms, postures, intonations and facial expressions. The silent omnipresent horror of the situation is that if Truman doesn't wake up to the lie of his life, he'll die within that lie, never having truly experienced anything. Despite the monolithic falsity of his life, Truman carries into adulthood the taste of the genuine being contact he experienced when his eyes met those of Laura (Natascha McElhone). Though Laura, too, was an actress in the show, she experienced a genuine exchange with Truman. Like the small voice of conscience, she tried to tell him the secretthat his world was false to the core. As with every situation where Truman comes close to waking up, Christof quickly puts him back to sleep by creating the appropriate external shocks to which Truman internally and automatically reacts. With Laura, Christof's intercession is more gross; he directs that she be whisked away by her actor-father, who tells Truman he is taking her away to Fiji. Though gone, Truman remembers Laura's messagethat something or someone invisible is watching his every move, controlling his whole world. Now he begins to notice the mechanical habits, patterns, and falseness of everyone around him, including his wife. (Interestingly enough, he does not notice his own automatism.) The evidence of his own observed experience eventually faces Truman with the question: if his whole world is built upon a phony premise, if everyone is acting, everything a prop, if he is the star puppet of his own show with cameras on him twenty-four hours a dayhow does he escape? Conditioned by Christof to have no guile, to be a 'good' person, Truman must act against the self-image that he takes to be himself. That is, Truman must intentionally fool his world...must become sly. To escape he needs time, but he is constantly watched. How to get the necessary free time? Ingeniously overcoming this psychic obstacle, he then faces the physical challenge. All of Seahaven's bridges are under camera surveillance. The only way off the island is by water. But water is Truman's chief aversion, because Christof, long before, by means of the father's drowning, has so conditioned Truman's subconscious.